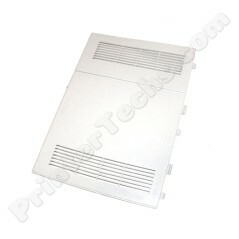 This is a refurbished formatter cover panel , HP part# RB1-8858-000CN. Fits any of the following printers: HP LaserJet 4000, 4000N, 4000TN, 4000DTN, 4050, 4050N, 4050TN, 4050DTN, 4100, 4100N, 4100TN, 4100DTN. HP LaserJet 4000, HP LaserJet 4000N, HP LaserJet 4000TN, HP LaserJet 4000DTN, HP LaserJet 4050, HP LaserJet 4050N, HP LaserJet 4050TN, HP LaserJet 4050DTN, HP LaserJet 4100, HP LaserJet 4100N, HP LaserJet 4100TN, HP LaserJet 4100DTN.